Halloween is the second biggest holiday of the year in terms of retail sales. Americans will spend an estimated $6 billion in costumes, decorations and candy. Let's face it, that's what makes the holiday so great. You can be someone else for the night and indulge on sweet treats without feeling guilty about it. But not all kids take advantage of this evening of treats. Those impacted by food allergies often have to skip the trick-or-treating because of getting the wrong thing in their bag could cost them their life. It's not just peanuts that can cause problems this time of year. More cases of allergies to red dyes are coming up as well. That's why the Teal Pumpkin Project was created. It's a way to let trick-or-treaters know your house is a safe one to stop by in search of goodies. There are a few simple ways to support the project. Hand out non-food treats. Things like pencils, temporary tattoos, stickers and glow sticks are popular alternatives to candy. 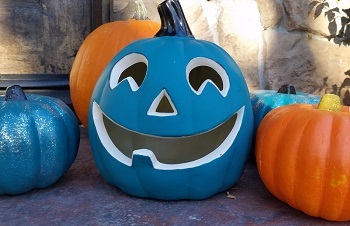 Display a teal pumpkin on the doorstep to let families know you're participating in the project. Display a printable sign in your window to reinforce the fact that you have non-food items for kids. You can learn more about the project and how to participate here. It's something to think about and a great way to make sure all kids are included in the festivities this year. I like the idea because we have friends (both kids and adults) who are allergic to peanuts and red dye. Now parents can have peace of mind knowing the people in their community care enough to make sure their kids stay safe this Halloween.